Only 2 left as of Dec. 1, 2017.� A thick opaque temporary UV Reactive Neon hair styling "gel" available in an easy to use squeeze tube. 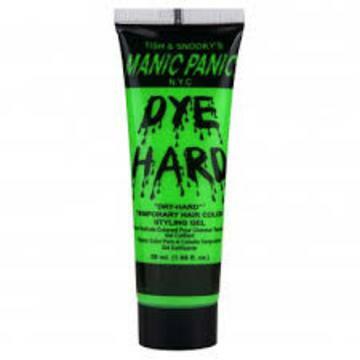 This hard holding formula may be used for styling as well as coloring.� In a rocking green neon color. DYE HARD® Gel is very easy to use: just place gel on fingertips or on a tinting comb and apply to hair. Get creative and have fun with it! It washes out instantly so you can't go wrong. DYE HARD® Gel dries hard and holds hair in place. This product does it all - styles, holds, adds color all in one. The DYE HARD® Gel may be used for spiking, tipping, adding a streak dash or splash of color, coloring an entire head. Best thing about the DYE HARD® Gel is that it shampoos right out of your hair with ease. Work it in… Wear it out… Wash it out!